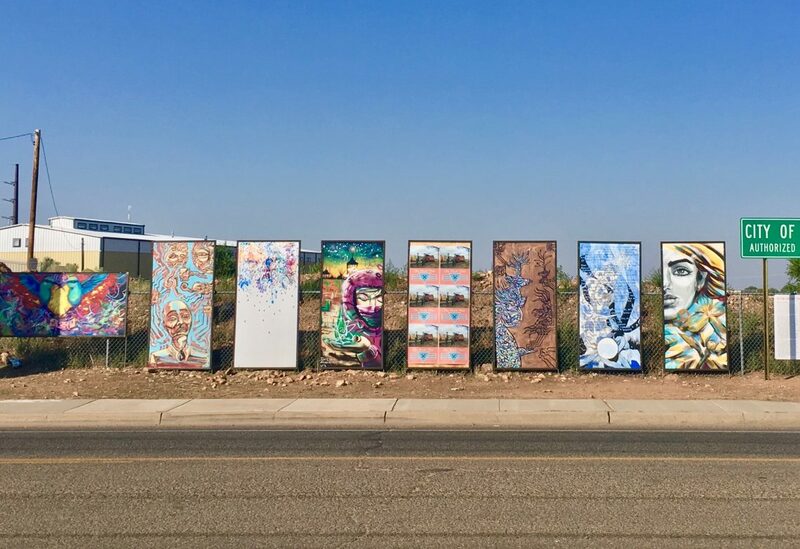 In the winter of 2016, the Siler Yard Arts and Creativity Center team reached out to seven community artists to create portable murals to be installed on the project site of the Siler Yard Arts + Creativity Center. The murals will be presented with a dedication by Mayor Javier Gonzales from 5:30-6:30 pm on Thursday, August 31st. The mural project was coordinated by local artist and activist Israel Haros Lopez who selected a diverse group of creatives and asked that they “speak to current culture and the future of culture.” The participating artists include Niomi Fawn, John Paul Granillo, Juan Lira, the SIB Collaborative, Jared Antonio-Justo Trujillo, Andrea Isabel Vargas-Mendoza (artwork pictured), and Israel Haros Lopez. Through portraits, written word, traditional imagery, and more, each artist took a distinctive and captivating approach to the idea of culture. The murals were set in handmade frames through a collaboration with MAKE Santa Fe. They will remain on display in front of the future Siler Yard Arts and Creativity Center location and eventually be incorporated into the future development. This public art project is part of a number of activities funded in part by an “Our Town” grant from the National Endowment for the Arts. The goal of these projects is to engage with the diverse Santa Fe creative communities to inform the design of the Siler Yard Arts + Creativity Center and make it accessible to the communities it hopes to serve. Many of the artists who created murals for this installation also participated in the design process for the project. To learn more about the housing project, and more about Israel’s concept for the mural project, please visit www.sileryard.org. This event is free and open to the public. Thursday, August 31st from 5:30-6:30 pm at the Siler Yard site on Siler Road across from Trades West Road. Parking at the Kitchen Angels and City of Santa Fe Public Works parking lot on the west side of Siler. The Siler Yard: Arts + Creativity Center is envisioned as affordable live/work/creation space where Santa Fe’s creative workforce can develop individual and collaborative projects and learn entrepreneurial skills as they transition from training to independence in the art markets. New Mexico Inter-Faith Housing (NMIF) is a 501(C)3 affordable housing development and resident services company founded in 2008, part of a collaborative group of seven independent non-profits providing affordable housing services across Colorado, Texas and the Gulf States. NMIF’s mission is to build, renovate and maintain affordable housing properties, and provide resident enrichment programs and property management services that improve the quality of life and financial stability of New Mexican families.